While reading about high efficiency heating products, I stumbled upon this helpful article by Energy Star. I thought it would be perfect to share on HTP's blog! Read on to learn about high efficiency water heating technologies. Visit www.energystar.gov for more information on Energy Star. Provide Hot Water for Less! 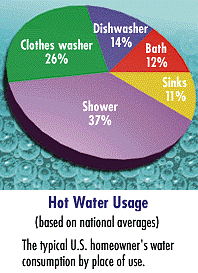 Heating water accounts for approximately 15 percent of a home’s energy use. High efficiency water heaters use 10 to 50 percent less energy than standard models, saving home owners money on their utility bills. Actual energy savings from high efficiency water heaters depend on family size, heater location, and the size and placement of water pipes. Demand (Tankless) Water Heaters. Water circulated through a large coil is heated only on demand using gas or electricity; there is no storage tank continuously maintaining hot water. A possible concern with this technology is the limitation on the number of fixtures that can simultaneously use hot water. However, there is an endless supply of hot water and stand by losses are eliminated. Heat Pump Water Heaters. Heat pumps transfer energy from the surrounding air to water in a storage tank.These water heaters are much more efficient than electric resistance water heaters and most effective in warm climates with long cooling seasons. Solar Water Heating. While the initial purchase price of solar water heaters is high compared to standard models, they can be cost effective.That is because the sun’s energy is harnessed to reduce operating costs up to 90 percent. Solar water heating systems require a conventional water heater as a backup water heating source to ensure hot water is available when solar energy is not. Demand (Tankless)Using Gas or Elec. First-Hour (FHR). FHR measures how much hot water will be available during the busiest hour of the day. A large tank does not necessarily translate to a higher FHR. The recovery rating is important as it indicates the water heater's ability to replenish hot water as it is drawn from the tank. Efficiency. The water heater’s efficiency is measured as an Energy Factor (EF) ,which is usually listed beside the Energy Guide label. The higher the number, the more energy efficient the water heater. ENERGY STAR is a voluntary partnership between the government and more than 9,000 organizations, including more than 3,500 of the nation’s homebuilders. Together with home buyers and their families, we are working to achieve a common goal — protecting the environment for future generations by changing to more energy - efficient practices and products today. ENERGY STAR is the government-backed symbol for energy efficiency. It identifies new homes, buildings, and more than 50 types of products that are energy efficient and offer the features, quality, and performance that today’s consumers expect. Products that can earn the ENERGY STAR include windows, heating and cooling equipment, lighting, and appliances. To learn more about ENERGY STAR, visit www.energystar.gov.